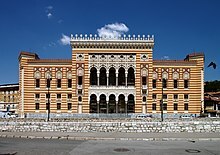 Sarajevo City Hall (Bosnian, Croatian and Serbian: Gradska vijećnica Sarajevo / Градска вијећница Сарајево), known as Vijećnica, is located in the city of Sarajevo. It was designed in 1891 by the Czech architect Karel Pařík, but criticisms by the minister, Baron Benjamin Kallay, caused him to stop working on the project. It was initially the largest and most representative building of the Austro-Hungarian period in Sarajevo and served as the city hall. The building was reopened on May 9, 2014. Alexander Wittek, who worked on the project in 1892 and 1893, fell ill and died in 1894 in Graz, and the work was completed by Ćiril Iveković. The edifice was built in a stylistic blend of historical eclecticism, predominantly in the pseudo-Moorish expression, for which the stylistic sources were found in the Islamic art of Spain and North Africa. Building works began in 1892 and were completed in 1894, at a cost of 984,000 crowns, with 32,000 crowns provided for fixtures and fittings. 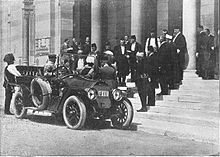 It was formally opened 20 April 1896, and handed over to the City Authority, which occupied the property until 1949, when it was handed over to the National and University Library of Bosnia and Herzegovina. The majority of the books could not be saved from the flames. The structural repair of the building was planned to be carried out in four stages: 1996-1997 (financed by a donation from Republic of Austria), and 2000-2004 (financed by a donation from the European Commission), and the city of Barcelona among others. The third stage ended in September 2012, with an estimated cost of KM 4.6 million (about €2.37 million) and will return the city hall to its former grace. The fourth stage began following the completion of the third stage and lasted about 20 months, finishing at the end of 2013 and cost of KM 14 million (about €7.23 million) which are secured through the IPA. In this stage the whole interior was built and reconstructed (paintings, sculptures, books), meaning the building is brought back to function. Everything that was possible to restore has been done so, while those things that were not possible to save have been made anew through special molds. The whole reconstruction and restore process was predicted to cost about KM 25 million (about €13 million). After it is repaired, the building, now a national monument, will be used for variety of events. Its space will be used for various protocol events for all levels of government, concerts and exhibitions. After years of restoration, the building was reopened on May 9, 2014, with the performance of Sarajevo Philharmonic Orchestra and Vedran Smailović. ^ "- vijećnica -". www.vijecnica.ba. Retrieved 2018-02-21. ^ For foreigners an event that defined the cultural objectives of the besiegers occurred during the night of August 25, 1992, the intentional shelling and utter destruction with incendiary shells of the irreplaceable Bosnia National and University Library, the central repository of Bosnian written culture, and a major cultural center of all the Balkans. Among the losses were about 700 manuscripts and incunabula and a unique collection of Bosnian serial publications, some from the middle of the 19th century Bosnian cultural revival. Libraries all over the world cooperated afterwards to restore some of the lost heritage, through donations and e-texts, rebuilding the Library in cyberspace. ^ a b Riedlmayer, András. "Erasing the Past: The Destruction of Libraries and Archives in Bosnia-Herzegovina". Archived from the original on 2012-01-18. ^ "Vijećnica na proljeće s nekadašnjim sjajem - Klix.ba". archive.is. 2012-09-10. Retrieved 2018-02-24. ^ Sito-Sučić, Daria (9 May 2014). "Sarajevo reopens landmark city hall and library destroyed in war". Reuters. Retrieved 9 May 2014. Hartmann, Kristen M. (2016-02-08). "Fragmentation and forgetting: Sarajevo's Vijećnica". International Journal of Heritage Studies . 22 (4): 312–324. doi:10.1080/13527258.2016.1138317. Riedlmayer, András (July 1995). "Erasing the Past: The Destruction of Libraries and Archives in Bosnia-Herzegovina". Middle East Studies Association Bulletin. 29 (1): 7–11. JSTOR 23061201.